It's Halloween weekend, the official start of this years desert season and with an estimated 73000 visitors expected, it's also one of the biggest desert camping weekends of the year. Large holiday weekends like Halloween, Thanksgiving, New Years, and Presidents always draw a large crowd so safe duning needs to be stressed more than ever. Keep your speed down around other campsites and please don't drink and ride. Remember, it's our behavior as responsible duners that will help preserve this great sport for all of the future generations to come. Have a safe and happy Halloween Duners! Listen up all you beer lovers! SandRazor now has custom designed, one of a kind, "Powered By Beer", t-shirts available for sale. Be one of the first to show the world your true love for beer with this SandRazor original "Powered By Beer" t-shirt! Don't wait, get yours now! For those of you that feel that being "Powered By Bacon" more appropriately describes you, there are also "Powered By Bacon" t-shirts available through one of my other web sites, ThePioneerWay.com. Get one for yourself, give one as a gift, or both! Both the "Powered By Beer" and the "Powered By Bacon" t-shirts feature an original design printed on a cotton t-shirt that is made in the USA by American Apparel. SandRazor "Classic" t-shirts are also now available. Don't be left out! The first big trip of the 2011 desert season is only days away. If you're still working on your sand rail, jeep, or other off-road vehicle, time is running out. Is your ride ready? Don't be left in the dark, light up those dunes with a new light bar from sandparts.com. Running your favorite sand slinging machine through dunes is one of the best times you'll ever have out in the ISDRA, but it's even more fun at night, so it's important to make sure that you have the proper lighting. 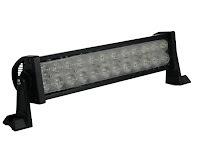 LED light bars from sandparts.com come with durable die-cast aluminum housings and are packed with high intensity LED bulbs that will light up the desert with minimal power consumption. Light bar models are available in either flood, spot, or combo beams and range from 6 inches to 40 inches, which make them the perfect addition to any sand duning vehicle. Why not brighten up your next dune adventure with a high tech LED light bar from sandparts.com?